The judges will view artists’ submissions on a screen so we’re keen for all photos to have the maximum impact and do the paintings justice. Follow these simple steps to take the best photograph of your self-portrait or landscape. 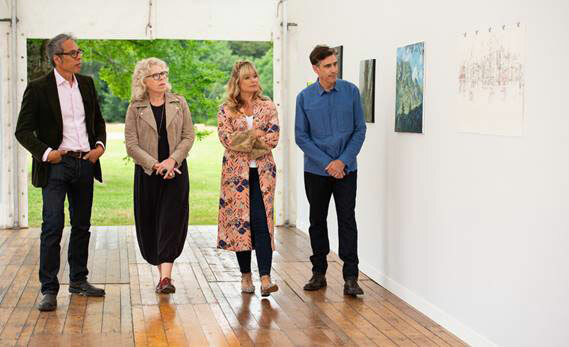 Filming of Portrait Artist of the Year will take place in April/May 2019. The heats are open to the public. If you’d like to receive information on filming dates , locations and updates about the series please join our mailing list or follow Sky Arts Twitter and Facebook pages. Terms and conditions apply. Please visit Portrait Terms for more information. Landscape painting is a peculiarly British fascination and this country has produced incredibly innovative artists such as Turner and Constable in this discipline. As the competition evolves and we introduce ever more interesting and complex locations, we hope to find artists who will rise to the occasion and emulate those great artists in a fresh and contemporary way. Landscape painting gives artists a real opportunity to be creative and thoughtful. I'm not looking for something 'correct' or 'accurate,' rather I want to see a particular scene through someone else's eyes. I really recommend applying, everyone tells us how much they get out of it. I want to see artworks that celebrate the great, the good, the bad and the ugly of our fabulous landscapes. Landscape in the broadest and most challenging sense. Whether you're a confident old hand or a tentative beginner, we can't wait to see what surprises are in store for us. Taking part in the competition has really raised my profile. I've made many sales and been offered teaching jobs and commissions as a result. For those thinking about applying this year, I’d say submit a piece you're really happy with that best reflects your practice and something you can readily talk about. Mixing with other artists got me studying their work and I was inspired by much of what I saw. The judges' comments were spot on, and although I didn't like to hear negative feedback at the time, their advice has helped me to think about how others perceive my work, and how my painting style changed when forced to cram everything into four hours. I really loved the whole experience of taking part in the competition. Meeting the other artists was great and finding out how they were getting on during the break was nice. I also loved discovering somewhere new to paint. I had never been to Lyme Park before, this competition got me there and I simply loved the place. The most interesting part was the tension and excitement and mixed feelings at the end when the winner was chosen. My advice for anyone taking part this year is just to be comfortable and have fun!